The PW Enns Centennial Concert Hall has a unique history. Originally built as a church, the facility served as a place of worship for decades. When the Winkler Mennonite Church congregation decided to build a new and larger facility, the city council of Winkler saw an opportunity to develop a special meeting place for the citizens of the community. After years of planning, designing and renovating, 2006 brought the official opening of the venue, in Winkler's Centennial year. 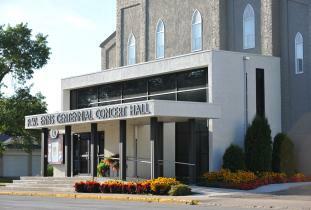 In June of that year the PW Enns Centennial Concert Hall was officially opened and named not only after Winkler's anniversary but also one of its most famous citizens. PW Enns was the founder of Triple E Canada in the mid 1960's. The company is the only manufacturer of Class A motorhomes in Canada.